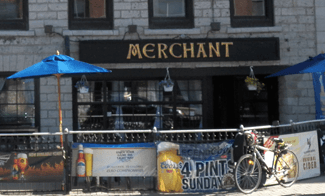 Known locally as “The Merchants”, The Merchant Tap House is a pub that was started in Kingston in 2005. It is located right at the bottom of Kingston street beside the waterfront, right beside the Holiday Inn. The Merchants is a great place to go for music. They have live bands every Thursday, Friday and Saturday usually starting around 10pm. There will occasionally be bands playing there on the week nights too. They also have daily specials – with the best specials being on Tuesdays when they have Customer Appreciation Night, with $3.50 Highballs and $4 Pints. The menu is always changing at The Merchants, and you will find an amazing selection of food there. Along with your typical pub favourites, they often offer a lot of different and semi-unique items. The Merchants also has a patio.